Halfway through his third year in office, President Barack Obama has begun his re-election campaign. On June 14th, President Obama made a brief, yet symbolically important, visit to the United States’ territory of Puerto Rico in a pointed effort to reach out to Latino voters, an increasingly powerful electoral base. President Obama understands the importance of the Latino vote in the upcoming elections and is making a determined effort to court the fastest growing demographic cohort in the U.S.
Latinos are scheduled to play an even more important role in the 2012 presidential election than in the past. Increasing 43 percent from 35,306,000 in 2000 to 50,478,000 as of 2010, the Hispanic population in the United States is at an all time high, comprising 16.3 percent of the total population. Mexicans make up the single most important body of Latinos living in the U.S., constituting 63 percent of the total Hispanic population with 31,798,000 people. There marks a significant relative decrease for the second largest Hispanic group in the U.S. — Puerto Ricans— who make up 9.2 percent of the total Latino population, with 4,624,000 people. [i] Despite the large drop off, Puerto Ricans, as well as smaller Hispanic groups, still represent a critical bloc of voters in a number of swing states. In addition to their position as a large electoral group, Latinos have become increasingly prevalent in key government positions, yet are still underrepresented. The Hispanic population has become an influential group for both the Republican and Democratic Parties, and such voters will continue to increase their influence in shaping the future of this country. Democrats have long counted on the Latino vote as a strong support base. In the 2008 presidential election, 9 percent of the total electorate was Latino. President Obama received 67 percent of Latino ballots, compared to Republican candidate Senator John McCain’s 31 percent. In fact, President Obama won many key swing states due in large part to support from the Hispanic bloc. For example, Florida, a state that is 15 percent Hispanic, has been particularly important in past elections, and support from its large Hispanic population is imperative to both political parties. For instance, President George W. Bush won 56 percent of the Floridian Latino vote in 2004, while, in 2008, President Obama won 57 percent. President Obama also won the key states of New York, New Jersey, Colorado, and California with the help of the Latino vote. [ii] Overall, the Obama administration has continued the Democratic tradition of appealing to Latinos by focusing on key issues, such as education, healthcare, the economy, and immigration reform—all of which are topics of central concern for much of the Hispanic community. On June 14th, President Obama became the first president to pay an official visit to the island of Puerto Rico since John F. Kennedy in 1961. Despite his lackluster speech and failure to delve into important issues, the visit held symbolic importance for the White House. President Obama had promised to return to the island after his initial visit during the 2008 campaign trail, and he highlighted his fulfillment of the promise during his recent speech in San Juan. Although the President flew one thousand miles off the coast of Florida for the visit, his main intent was to receive political backing from the Puerto Rican population on the mainland. For the first time in history, a significantly greater number of Puerto Ricans live on the mainland than on the island of Puerto Rico. Currently, 3.7 million Puerto Ricans live on the small Caribbean island, compared to the 4.6 million living throughout the continental United States. Puerto Ricans contribute an important swing vote in several states, including New York, New Jersey, and the historically highly fought-over state of Florida. Recently, there has been an influx of Puerto Ricans in the Orlando area, swelling the Puerto Rican residency to around 840,000 in Florida. The state’s Hispanic population is largely Cuban, and mostly conservative, but Puerto Ricans may eventually alter this dynamic. In 2008, Puerto Ricans donated USD 4 million in itemized federal political donations, with the majority donated to Democrats. [iii] Island Puerto Ricans also contributed USD 1.7 million to federal political candidates and to political affairs committees during the 2010 midterm elections, 80 percent of which went to Democrats. In 2012, President Obama will look to these lush electoral areas for strong backing at the polls. In addition to courting Puerto Ricans, President Obama has been trying to appeal to the rest of the country’s Hispanic population by focusing on immigration reform. 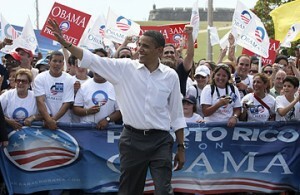 On May 10th, Obama delivered a speech in El Paso, Texas, on the theme of immigration and the DREAM Act. The location of this speech was symbolically significant as well, since 25 percent of the Texas population is Latino. [iv] Although of lesser consequence for Puerto Ricans, who are U.S. citizens by birth, immigration reform is a key issue for the rest of the Hispanic community. According to a recent impreMedia/Latino Decisions poll, 53 percent of Latinos know someone who is an undocumented immigrant and 25 percent know someone who has faced detention or deportation for immigration reasons. Thus it is no small surprise that 51 percent of Latinos view immigration reform and the DREAM Act as the most important issue facing the Hispanic community today. [v] This is the first time that immigration has overtaken jobs, the economy, and public education as the most important issue for the Hispanic community. If President Obama can provide a stronger plan for immigration reform than the Republicans, he has a great chance of winning over the Latino vote. While the Republicans will have their work cut out for them when competing for the Latino vote in 2012, the field will likely remain open. Surprisingly, in 2004, George W. Bush was able to win a substantial amount of the Latino vote, with a total of 44 percent. [vi] However, with recent “anti-immigrant” laws passed in Arizona, Alabama, and Georgia, Republicans have tarnished what little popular appeal they once had with Latinos. As a result of these laws and “anti-immigrant” rhetoric, 76 percent of Latino public opinion believes that there exists an anti-immigrant and anti-Latino bias in the U.S. Furthermore, 49 percent of Latinos believe the Republican Party does not care about them, and 23 percent believe the Republicans are hostile to Latino interests. [vii] Although it is highly unlikely that the Republican candidate will win the majority of Latino votes, Republicans may nevertheless hold sway in certain key states such as Florida. In order to win these votes, Republicans will have to address the situation directly and heed the advice of former Republican Michael Bloomberg. The New York City mayor recently stated that “the American dream cannot survive if we keep telling the dreamers to go elsewhere…It’s what I call national suicide—and that’s not hyperbole.”[viii] Although most Republicans do not agree with Bloomberg, they would be wise to follow his lead. In order to win over the Hispanic population in the United States, both President Obama and the Republican nominee will need to address the key concerns of the Hispanic community: immigration reform, jobs and the economy, education, and health care. The rejection of the DREAM Act, coupled with a plethora of other adverse rulings against the Hispanic community, has devastated millions of supporters while contributing to the growing anti-immigrant atmosphere building within the U.S. Consequently, simply talking about the issues will not be enough. President Obama had promised the Hispanic community immigration reform since the beginning of his campaign, but has so far failed to follow through. Although his party must take some of the blame, no one at the time believed that accomplishing this mission would be easy, given the strong opposition coming from Republicans. In fact, 41 percent of Latinos believe Congressional Republicans have been opposing or blocking immigration reform, and 33 percent believe they have been ignoring or avoiding the issue. It is clear that the Republicans need to address the issue of immigration reform and to propose a legitimate policy that the American people can take seriously. Legislative bills such as the one proposed by Texas Republican Representative Lamar Smith, which would require all employers to use the federal electronic system “E-Verify” to ensure employment eligibility, will only play to his own party and fail to reach across the aisle. While Republican support will help expedite the process, President Obama must also work tirelessly on this issue until a substantial reform is made and his promises are fulfilled. On economic issues in particular, Obama will need to convince the Hispanic community, as well as the entire country, that there is a light at the end of this dark tunnel. During a time of heightened tension in the U.S., the increase in attention given to its Hispanic community will be well deserved. Having become the country’s largest minority population, Latinos have become as “American as apple pie.” As the electoral base and the number of Latino political officials increase, they will hugely influence change. The U.S. needs to understand this evolution and work toward creating a “Latino-friendly” environment, rather than the “anti-Latino” road we find ourselves on. Latinos undoubtedly will play an important role in the forthcoming election and will be overlooked by the candidates only at their own peril. The fact is that Latinos are now an abiding force in American politics and to be successful, the next president will need their support.